A number of the choir gathered with family and friends at Chy an Gweal Methodist Church, Carbis Bay, for the funeral service of Rose Buckley. Rose was a committed member of the choir and sang in the alto section. Rose was also a committed Christian who regularly attended Chy an Gweal, where she would often lead worship. At the funeral the congregational songs were 'Amazing Grace' and 'What a friend we have in Jesus', which are a reflection and testimony of what she believed. Knowing God's grace and having Jesus as a personal friend and Saviour meant that Rose would sing such songs with confidence that gave her peace and joy. She was 'on a higher plane'. Now her faith has taken her, literally, to a higher plane, forever with her Lord. 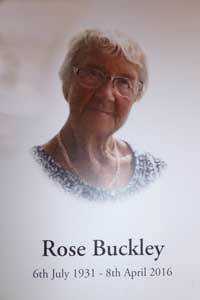 We remember Rose with affection and miss her presence with the choir. Our thoughts and prayers are with her family.